Yes, it’s raining out there! 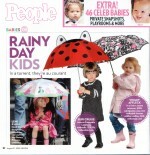 For those of you who keep track of these things, it’s Suri Cruise with a Kidorable ladybug umbrella, the same one we carry here at Junior Towne along with the matching rainboots and raincoat. Check her out in the Aug. 31 issue of People Magazine. With our rainy days in August and September (especially for the Fair) we carry a complete selection of Columbia rainsuits, Kidorable raingear, Muddy Buddy coveralls and rain pants. And don’t forget-one and two piece snowsuits (sizes 2-20) are $10 off tomorrow-Saturday, August 29. I bet there is termination dust on the mountains when the clouds let up! Friday, August 21 and Saturday, August 22 our national Britax Sales Representative will be on hand to answer all your questions about Britax and especially car seat safety as well as the importance of side impact protection in the event of a crash. On Saturday from 11 AM to 1 PM have get a free carseat safety check from our friends at Safe Kids, the nationally certified carseat technicians. While you’re here, sign up for our drawing for a free Britax Advocate-a $350 value! In addition, take $50 off any Britax carseat (Roundabout, Marathon, Boulevard or Advocate) or the Frontier Booster Seat, $25 off the new Blink stroller and a rebate (ask us for details) of $100 on the purchase of the new Chaperone infant carseat and stroller system. Comfort: To feel warm inside when it matters most-everyday! Durable: To be strong beyond what is expected throughout the school year. Value: To get a special feeling inside when you feel beyond satisfied about a purchase decision. So create some special memories! We’ll see you soon! Remember-we have been dressing little Alaskans for over 50 years! …and of course, school uniform and dress code selections for Holy Rosary Academy, Lumen Christi High School, Pacific Northern Academy and Saint Elizabeth Ann Seton School among others. August means back to class here at Junior Towne. We have a great new selection of back to school clothing from Ginger, Plum Pudding, Roxy, Quiksilver, Haven Girl, Hartstrings and Cotton Kids. Our lunchbox/backpack selection is outstanding! Saturday, August 8-50/50 Sale-All girls heavyweight striped and floral cotton tights are 50% off/All boys lightweight jackets are 50% off. Saturday, August 15-20% off all Stride Rite shoes. Saturday, August 22 and Friday, August 21-Britax carseat sale and carseat check. Come see the new styles and see us for details on the sale. Our Britax rep will be here to answer any questions that you might have. Please remember that these specials are good only on the dates specified. You are currently browsing the Junior Towne Blog weblog archives for August, 2009.